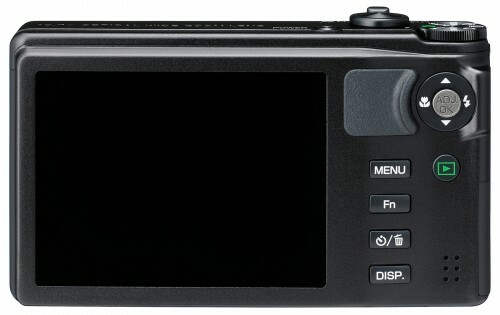 Ricoh has announced the new Ricoh CX5 – with new hybrid AF system – it updates the CX4 (read our review here) with quicker AF, new scene modes (Cooking/Food, Fireworks and Golf swing), and super resolution technology for improved details, the camera features the same specifications as the CX4: wide angle 10.7x optical zoom (28-300mm), 3″ screen with 920k pixels, 10 megapixel CMOS sensor and 5fps shooting, anti-shake sensor, 720p HD video, HDMI out, ISO3200, and lithium ion battery. The camera will be available in Black, Silver and Pink from the end of February priced at £259. 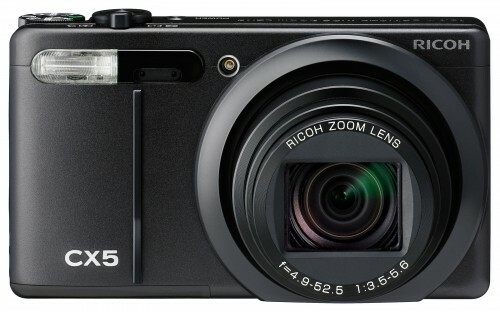 “RICOH COMPANY, LTD. (helmed by president and CEO Shiro Kondo) will be releasing its newly developed CX5 digital camera model with its wide-angle, high magnification 10.7´ optical zoom (28–300 mm) lens, which has a higher autofocus speed due to the use of Ricoh’s new hybrid AF system. With the new CX5 model, AF focusing times are decreased to as low as 0.2 sec. for both wide-angle 28 mm and telephoto 300 mm, up to half as short compared to the CX4, using Ricoh’s unique new hybrid AF system. This ensures that you reliably capture the image you were waiting for, never to miss another good shot again. Furthermore, in addition to the new Cooking, Fireworks, and Continuous Golf Swing scene modes, the CX5 has improved features that make shooting photographs even more fun through the use of super-resolution zoom during Zoom Macro mode shooting and other functions.